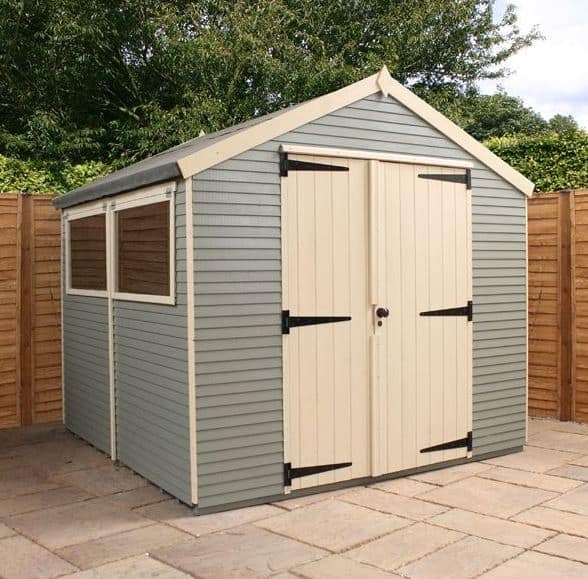 Created from high-end Shiplap cladding, this incredibly durable and structurally secure shed comes with an impressive amount of features. Extra tall eaves and a traditional apex roof provide a spacious design, while a 10 year anti-rot warranty gives you complete reassurance. Single glazed windows help to provide natural lighting, while the antique hinges give the building a unique, impressive design. You can store valuable items with peace of mind thanks to the secure design of the building. 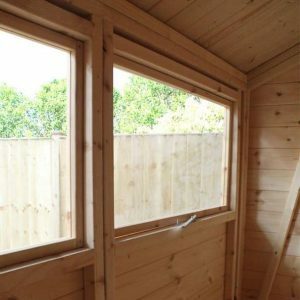 It is not only designed with thief-proof 16mm Shiplap cladding, but it also comes with a good quality Rim lock. In order to ensure the building is fully supported, it also benefits from extra thick, planed and rounded framing. Not only does this provide fantastic support, but it also offers a smooth, stylish finish. It’s always a good sign when a manufacturer pays just as much attention to the interior of the shed as it does with the exterior. With no real extras needed to enhance the building’s quality, it offers pretty great value for money. Overall this is a building we are really impressed with. 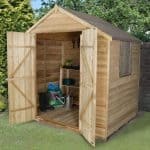 It offers so much more than your basic garden shed and it even benefits from a super-strong 16mm thick tongue and groove floor. 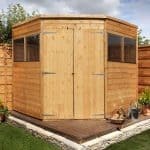 This shed does come at a higher cost than a lot of other similar sized buildings but it supplies excellent value for money when you factor in the impressive features and benefits. This is a tall, outstanding storage shed provided by one of the most respected manufacturers in the industry. The extra tall eaves and apex roof help to make the building more comfortable to move around in and also make it easier to store tall, awkward items. The roof comes with free heavy duty mineral felt to enhance its water resistance, as well as to protect it from damage caused by debris. Measurements include a 1.69m eaves height and 2.31m roof height. The spacious double doors also reach an impressive 1.30m high and are also 1.30m wide, offering a great symmetrical detail. The width of the shed measures 2.57m, while the depth measures in at 3.06m. So whilst you are given plenty of internal space, the building doesn’t take up too much external space, making it ideal for most homes. We were surprised by the quality of the construction of this shed. Whilst Shiplap tongue and groove cladding isn’t a rare feature, what is rare is that the Mercia Ultimate Shed uses 16mm thick Shiplap. The thing with Shiplap cladding is that different manufacturers use different thicknesses. The thicker it is, the more durable the building will be. 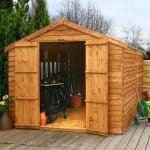 To put it into perspective, the most common thickness found on wooden sheds these days is 12mm. So the fact this shed has 16mm cladding highlights its outstanding quality. It isn’t just the walls of the building which benefit from this thick cladding however. The roof and floor are also created with 16mm Shiplap. This again is rare as a lot of manufacturers save costs by using solid sheet materials. It’s impressive if you find a shed that has a 12mm thick Shiplap floor, never mind a 16mm one! What this means in terms of practicality is that you have no worries storing even the heaviest machinery. 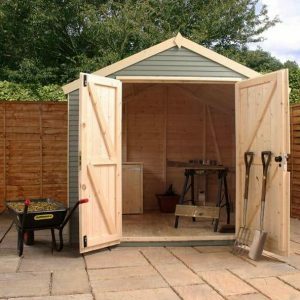 It opens up numerous possibilities for how the shed can be used. For example, you could choose to turn it into a workshop if you wanted to. When you’re dealing with such thick exterior cladding, you need to know the frame is capable of supporting the weight of the structure. Therefore you’ll be pleased to know that this building also comes with extra thick framing. It measures 44mm x 44mm, with most standard sheds offering 25mm x 25mm framing. As you can see, everything about the structure of this shed has been built to an exceptional standard. 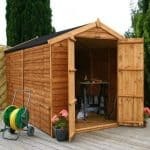 The shed comes with a 10 year anti-rot warranty, though it’s important to familiarise yourself with the terms and conditions. One of the main things to be aware of is that you will not be covered by this warranty unless you treat the building in accordance with the manufacturer’s instructions. First and foremost it requires a spirit based timber treatment either shortly after you have finished assembling it, or prior to assembly. Additional treatments will then vary depending upon the type and brand used. Waltons do treat the building before they ship it out with a water based treatment. However, you will find this is only to protect it while it is on its way to you. The reason the company suggests a spirit based treatment is because these give a long-lasting protective barrier against the elements. Rather than just sitting on the timber’s surface, the treatment penetrates down into the actual inner layers of the wood. It is there that it produces a strong barrier. So it isn’t just the building’s surface that is protected; it is literally protected from the inside out. The shed comes with both windows and large double doors. There are two, large single glazed windows which offer a good level of lighting into the building. The doors are another of the shed’s most notable features. Hung with black antique style hinges, they have a very rustic and stylish design. They are also painted a nice cream colour which contrasts beautifully with the rest of the building. Waltons have also given the doors a ledge design, with fantastic thick cross beams which protect them from sagging. 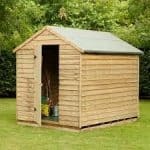 One of the main qualities of this shed is its fantastic, robust design. It offers a very secure building thanks to its tough cladding and Rim locked doors. 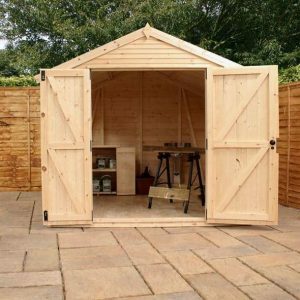 The only thing we would suggest is that if you are going to be storing anything expensive in the shed, you should be sure to cover it up. This is because the windows will provide a fantastic opportunity for thieves to see what’s inside. Of course, you can remedy this by installing blinds or curtains. This is a particularly good idea if you want to use the building as a space to work. The only real customisation option available is the choice of where you install the windows. When assembling the shed you have the flexibility to install the windows on either the left or right side of the building. This is helpful as it doesn’t limit where you have to put the shed. You can also choose to install the windows on the side which is likely to be the most private and away from public view. There are a couple of extras you might want to invest in. The first is an electrical pack. Now keep in mind this is a fairly expensive extra and it will require specialist installation. However, it helps to add a power source to the building, which means you will be able to operate machinery, as well as add natural lighting to the shed. The second worthwhile extra is the weatherproof lock. This is actually a very high quality padlock and it is sold with a Hasp and Staple. It boasts some pretty impressive features such as the Thermoplastic weatherproof jacket, steel laminated body and double locking capability. The keyhole is even covered up so rainwater doesn’t get in and cause rust. These are the two main extras that can prove pretty useful. Other options you have include several different treatments, Draper accessories and an installation service. Obviously treatments are required so it can make sense to add them to your order rather than trying to find a suitable option elsewhere. There’s also the peace of mind that the treatment you buy will meet the warranty requirements. Draper accessories such as the Cordless Rotary Drill, can be useful if using the building to work. Draper is known as one of the highest quality power tool manufacturers. Finally the installation service can save a lot of time and effort, but it is also going to bump the cost up quite a lot. So you need to weigh up whether the extra cost is worth the stress you will save. Keep in mind that if you do choose this installation service, it won’t include the installation of the electrical pack if you do get one. There’s absolutely nothing we can fault with the quality of this shed. From the substantially thick framing to the very stylish painted finish, it is definitely one of the highest quality buildings we have reviewed. The shed doesn’t just look stylish, it also boasts an incredibly robust design. Thanks to the exceptional high quality materials used, it naturally comes with a long-lasting construction. The only thing that slightly lowers its rating for us is that you will need to apply regular treatments (annually) to maintain the longevity. As you can also add interior shelving thanks to the strength of the cladding and structure, this shed offers a fantastic amount of storage potential. You could also hang hooks on the interior walls which can hold power tools, cables and heavy items. As it comes with interior height added by the apex roof, you can also store taller things such as sports equipment with ease. This is actually pretty simple to install. The manufacturer has supplied great instructions and provided you enlist the help of at least one other person, it shouldn’t take too long to assemble. Saying that, it will still take a few hours but compared to a lot of other similar sized buildings, this is actually really good timing. The extra money you pay for this shed compared to other similar buildings is paid back through its great impressive features. It offers really good value for money when you consider what you’re actually getting with the cost. 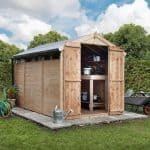 Final Thoughts: The Mercia Ultimate Shed is designed for those looking for something more than the average, basic storage space. It has been constructed with exceptional eye for detail, offering both superior quality and a unique, rustic style. Benefitting from 16mm Shiplap cladding throughout, this shed is truly built to last. With no real extras needed, it offers superb value for money. Just some of its standout features include antique hinges, a great 10 year anti-rot warranty and extra thick framing. It is also painted which you will find refreshing if you’re not a fan of the standard, natural unpainted look. You really will struggle to find a more attractive, higher quality building than this one.